In the last years, we played eight gigs in the Czech Republik and Slovakia, most of them together with the DJs Papa Django and Swing Thing from Electro Swing Bohemia. 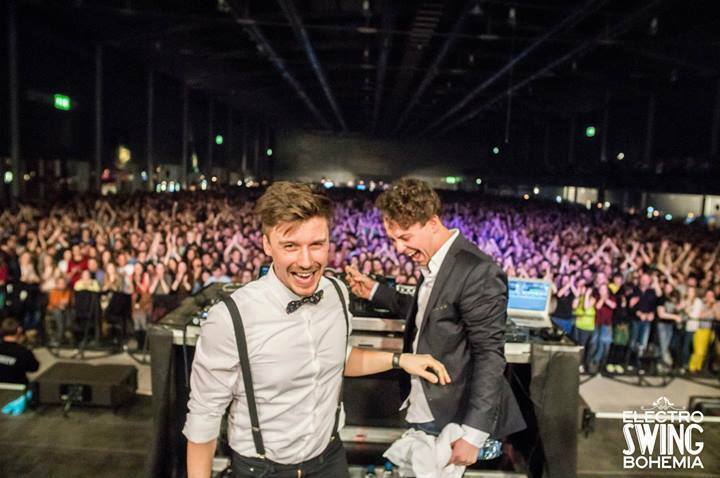 Roman and Jakub, who did a great job in establishing one of the world´s biggest Electro Swing bashs in cities like Prague or Brno, constantly travel between venues in CZ,SK and Poland and are regularly headlining big festivals over there. They´re also known for their Balkan Beats-Project Malalata Soundsystem-a synonym for energetic live shows and their symbiotic relationship with their audience. It´s time to have a chat with the guys and let them explain the extraordinary developement of Electro Swing Bohemia. Guys, the last years had been crazy for you.Hundreds of gigs and a constantly growing audience. Could you describe what happened in the last years!? Well, yes, last 2 years were amazing. We have no exact explanation, but there could be a few reasons. First of all, we’ve tried really hard for the last 5 years and we’ve tried to do it profesionally. After a few huge gigs at festivals, After-Show-gigs of bigger concerts, the audience at our parties grew rapidly. In a consequence of that, we added new bigger venues, new cities and also new countries for our resident parties. How would you describe your sets as Swing Thing & Papa Django? What is the reason for your popularity in CZ and SK? We give priority to a live show and a contact with our audience. We think that the one specific reason, why people like our sets so much, is the fact that we try to react to and exchange energy with them. And we also prepare many surprises for the shows. How does the work as promoters and as DJs go together? That’s very important point for us. As promoters and DJs at the same time we have a considerable room for creativity and freedom to do parties in a way we like. We also have the first and last word in guests we invite for the parties. Electro Swing Bohemia refers to a former decade of history. How is your relation to this part of music history and is there a influence of historical Czech music in your sets? Yes, we have a close relation to vintage swing music. The word „Bohemia“ is in our point of view connected with the czechoslovakian history and music. We love to play that music in our sets. For example, the great and also very funny slovakian cabaret singer Frantisek Kristof Vesely, who was famous especially in the 1930s. What were your three highlights in your career and why? We enjoyed really strong emotions during a show at the most famous Slovak festival Pohoda. The biggest show and crowd we’ve ever had was during an after-set of The Parov Stelar Band in Brno this year with more than 8 000 people. But the most complicated mission that we completed was our tour in Mexico and USA last summer. What are your future projects and plans? We woud like to start off the next season with the same or even bigger intensity than the last one. But the real goals for the future are our gigs in Tokyo, London and Paris.